Many companies as part of their corporate well-being scheme deliver advice on desk-based and standing ergonomics. On many occasions this is delivered by appropriately qualified Level 4 Low Back Pain personal trainers. So we shall look a little more at the specifics of the key factors when setting up your desk for minimal risk of low back pain, altered posture and musculoskeletal dysfunction. More generally, it is recommended that you sit in a comfortable and supported position and that every hour you get up, have a little wander around the office and, where possible, stretch. What you are trying to avoid is the following body positions being observed as the day goes on. 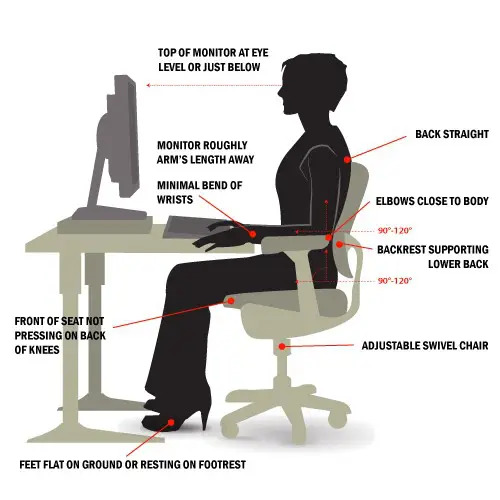 A little time spent considering how you sit at your desk can pay massive dividends when it comes to the avoidance of low back pain and general aches and pains. Go check your desk now! Tom Godwin (@TomForesight) has been involved in the fitness industry for over 18 years and has been involved with personal training, business/career development and corrective exercise. He is currently involved in personal trainer education as a tutor, assessor and course developer for TRAINFITNESS.